Congratulations to our Sound Kitchen Clients! All of these winners have worked with us throughout the years and we're very excited about their success. MURFREESBORO, Tenn. – The 2010 SGN Music Awards were handed out at a special concert celebration in Smyrna, Tennessee to a standing room only crowd. The award winners were spread evenly throughout the course of the evening as three artists and one songwriter walked away with four awards apiece. Karen Peck & New River, who tied with the most nominations this year, walked away with Song of the Year and Country Song of the Year (for “I Want to Thank You”), Progressive Southern Album of the Year (for No Worries), and Fan Favorite Artist of the Year. The Booth Brothers won their sixth Male Group of the Year award this year, as well as Progressive Southern Song of the Year (for “What Salvation’s Done For Me”), Best Live Performer, and Special Event Project of the Year (for Jubilee!). Hit songwriter Rusty Golden was the most awarded individual of the night – taking home four SGN Music Awards for his songwriting contributions. He won Song of the Year and Country Song of the Year (for co-writing “I Want to Thank You”) as well as Progressive Southern Song of the Year (for co-writing “What Salvation’s Done For Me”). Rusty also won the coveted Songwriter of the Year (Professional) award. What an amazing group of artists. We continue to celebrate their success! 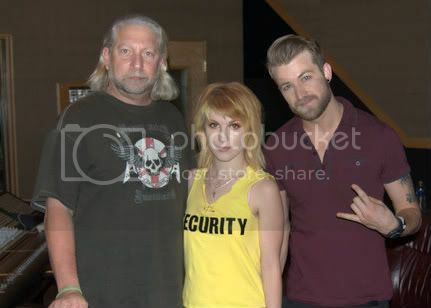 Franklin, TN: Rock sensations, Paramore, stopped by The Big Boy Studio to film some footage for FUSE TV. The piece will air later this month on Fuse. The power-pop-punk fivesome known as Paramore dates back to the band's high school years in suburban Franklin, Tennessee. Lead singer Hayley Williams was just 14 when she met guitarist Josh Farro and his younger brother, drummer Zac. Jeremy Davis and Hunter Lamb joined on bass and guitar respectively. The group started off gigging in Nashville in 2004 and quickly rose to popularity in early 2005, when Fueled By Ramen (The Academy Is..., Gym Class Heroes, Panic! At the Disco) founder John Janick signed the band almost immediately after seeing them perform in Florida. Paramore played the Warped Tour during the summer of 2005 and then released their debut album, All We Know Is Falling -- hailed by The New York Times and Spin magazine -- followed by a sold-out tour of North America in 2006. Paramore recorded their sophomore album, RIOT! in the winter of 2007 and released the album June 12 of that same year, selling 44,000 its first week in the U.S. Celebrating the end of their 20th anniversary tour by headlining A Vintage Affair’s “Legends at the Sound Kitchen” April 12 seems completely appropriate to Little Texas drummer Del Gray because it fits with the band’s commitment to family and community. “We are what we ware. 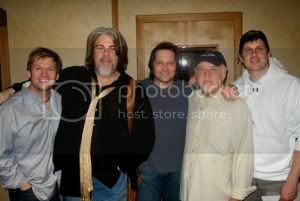 We are a rocking country band,” Gray said. “I am not sure how long we get to play, but it will be up beat and exciting. “We are basically a rocking Eagles. We have big vocals,” said Gray, adding the guys in the band — bassist/vocalist Duane Propes, lead guitarist/vocalist Porter Howell and rhythm guitarist/vocalist Dwayne O’Brien — have written many of their hits, as well as having success individually as songwriters. Filling out the bill at “Legends at the Sound Kitchen” will be Crossville native Mandy Barnett, who started singing at 5-years-old and as a teenager, drew national acclaim when she starred as country music legend Patsy Cline in the stage show “Always . . . Patsy Cline” at the celebrated Ryman Auditorium in Nashville. Barnett has released two albums and has appeared on “The Late Show with David Letterman” and “The Tonight Show with Jay Leno” as a result of her acclaim. She is currently working on a variety of projects and a new CD for release this year. She continues to play shows, both nationally and internationally, and is a frequent guest on the Grand Ole Opry. Barnett will reprise her role as “Patsy Cline” in the acclaimed production “Always . . . Patsy Cline” at the Ryman Auditorium in Nashville, during June and July 2010, in honor of the 50th anniversary of Patsy Cline’s induction into the Grand Ole Opry. A new event Tuesday, April 13, “Cigars & Cordials,” will be held at the Franklin Men’s Club, featuring the food of Giovanni’s Restaurante in Nashville, as well as the cigars of CAO and cocktails created by Horizon Wine and Spirits. Century Construction is the evening’s sponsor and tickets are $75 per person. A Vintage Affair Managing Director Ashley Roberts the event will feature a “speakeasy type” atmosphere with the vintage cocktail recipes and CAO cigars, but the Men’s Club does feature a non-smoking area where those not wishing to be near the cigars can enjoy the evening. Order tickets online or get more info at www.avintageaffair.org for this or any of the week’s events, including the Main Event April 16 at The Factory at Franklin.